Ankle replacement surgery is a treatment option for people suffering from symptoms of severe ankle arthritis. Ankle arthritis can cause pain, stiffness, and difficulty walking. Most often, ankle arthritis can be treated with non-surgical treatments including ice, anti-inflammatory medications, and activity modifications. However, in some people, the condition can worsen and become debilitating despite appropriate treatment. Ankle replacement is performed by removing the worn out ankle joint, and placing a metal and plastic implant on the end of the shin bone (tibia), and the top of the ankle bone (talus). The replaced joint allows for smooth motion at the ankle joint so that the foot can easily bend up and down. The challenging part of ankle replacement surgery is ensuring that the complicated procedure is only performed on appropriate patients. Performing ankle replacement on the wrong patient tends to lead to bad results, and often requires additional surgery down the road. Only a few patients who have ankle arthritis are really good candidates for this surgery, so the first, most important step is to determine if this is the right treatment for you. Ankle replacements are generally recommended in older, less-active patients who should not perform activities that would place high demands on the implanted joint, such as sports or heavy work activity. Ankle replacements are not as durable as hip and knee replacements, so even though heavier, more active patients get those surgeries, that doesn't mean that ankle replacement would necessarily be appropriate. Younger patients tend to be too active for current ankle replacement implants, as they place too much demand on the implanted prosthesis. Most patients under 50 years of age will therefore have ankle fusion surgery. In patients over 50, ankle fusion will still be offered to those who are more active and place more demands on the joint. Patients who are overweight should generally avoid ankle replacement. Obesity increases the burden on the implanted joint, which can lead to problems. Other patients who should avoid ankle replacement include: patients with ankle infections, patients with poor blood flow to the feet (peripheral vascular disease), and patients with severely abnormal alignment or stability of the ankle. When an ankle replacement is performed, the worn-out joint surfaces of the end of the shin bone (tibia), and top of the ankle bone (talus), are removed. This is performed with precise instruments to create a level surface for the implanted prosthesis. The surgeon then places a metal and plastic implant into the bone ends to function as a new ankle joint. 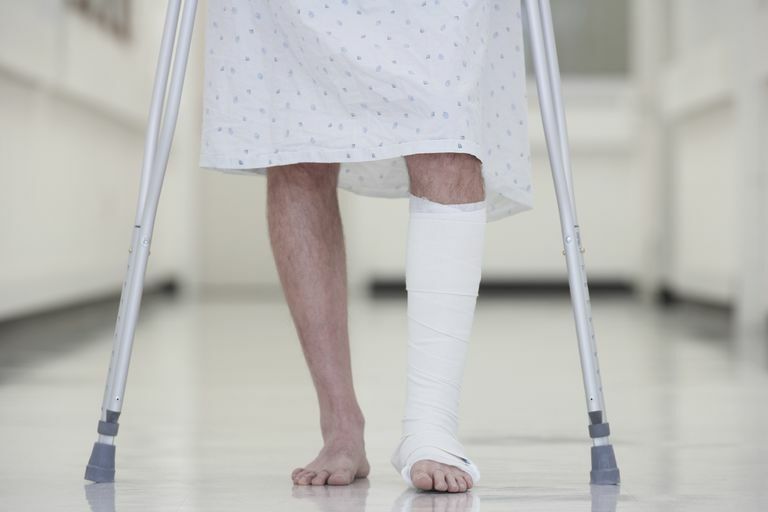 Patients undergoing ankle replacement generally spend one night in the hospital after surgery. Pressure on the ankle replacement must be limited with the use of a walker or crutches for several weeks. Complete recovery from an ankle replacement takes about three months. Complications of ankle replacement include infections, wound healing problems, and persistent pain in the ankle joint. Achieving satisfactory alignment of the implants to allow for normal walking is difficult, and cannot always be achieved. If the ankle replacement does not work, it may need to be removed from the joint — after which an ankle fusion surgery would be performed. Ankle replacement surgery is a relatively new procedure, so the long-term results are not yet well understood. What we do know is that properly-selected patients who have the surgery according to the recommendations listed above tend to have very good results. Recent research has shown that results of surgery are comparable to the results from ankle fusion surgery, meaning satisfaction rates around 85%. Unfortunately, no one really knows how long the current implants will last. Newer implants have been designed to last longer than older-style implants, but whether this will mean there's improvement in longevity of the implants is a question only time will answer. Research has clearly demonstrated that, for good results, patients must fit the aforementioned criteria. Patients who are younger, heavier, or have more active lifestyles are much less likely to have a successful, long-lasting ankle replacement. While ankle arthritis is less common than hip or knee arthritis, the result of having an arthritic joint in your lower extremity can be problematic no matter which of these joints is affected. There are several options for people with severe arthritis of the ankle joint, and one of these might be an ankle replacement. Ankle replacement surgery is undergoing constant improvement, and the current implants seem to last the longest and be the most effective in more sedentary people. Easley, ME, et al. "Total Ankle Arthroplasty" J. Am. Acad. Ortho. Surg., May/June 2002; 10: 157 - 167. Why Are Salespeople in the OR During Your Joint Replacement Surgery?